“Thanks so much for a wonderful couple of days! The student feedback has been great – I think this was just the tonic they needed as they are so busy & stressed with impending deadlines! Definitely looking forward to doing this again next year!” Katie Hanson Murdoch – lecturer at Sheffield Hallam University. It had been snowing and raining hard all week and the ground had turned to welly-deep mud. Miraculously though the rain held off for the afternoons of the trips, and the hardy students who braved the elements were rewarded with a glimpse of sunshine too! 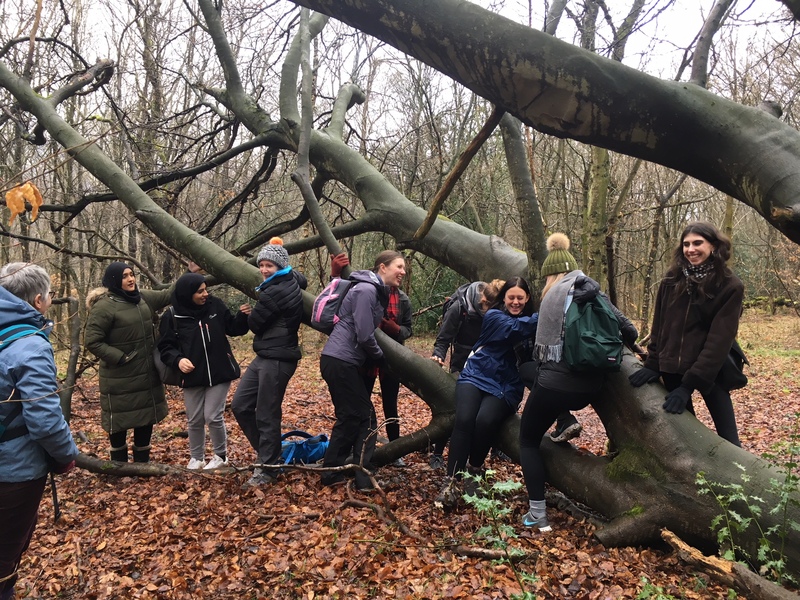 The final year psychology students from Sheffield Hallam University came out to Grindleford to learn more about the benefits of being outdoors for our mental health and to discover the plants and trees I use medicinally to treat mental health and other conditions. We also had guided meditations and discussions on mindfulness from the wonderfully wise Sian Podmore. The students had the opportunity to taste the sap from Silver Birch and sampled a herbal tea made from leaves and flowers of lemon balm, rose and passionflower. We talked about the trees we saw and how they live in a community and have their own form of communication and defence mechanisms. We discussed symbiotic and parasitic relationships in relation to plants such as moss, ivy and honeysuckle. I pointed out many of the little, overlooked plants that have such fantastic medical or nutritional value. Lastly we focused on the gut-brain connection and how the health of our gut affects our mental state. As a medical herbalist I always place great importance on the health of the gut as without addressing this other treatments are unlikely to be successful.